This is the third edition of the Brainerd/Baxter Strong Town series, where we look at the practical, real-life approaches to building a Strong Town using my hometowns as an example. I recommend reading the kickoff article for this series if you have not already. In the last edition of this series, we talked about the sidewalks in Gregory Park. I mentioned in that article that reviving Gregory Park is a first step to reviving Brainerd. I did not mean that rhetorically or socially but in a very physical sense. Gregory Park is a critical community resource that is precisely located to create value. At one time, before Brainerd embarked on a development strategy centered almost entirely around accommodating autos and auto-oriented development, Gregory Park was the terminating vista for the parkway that formed Brainerd's spine. While the downtown was the hub of activity, with theatres, shops and restaurants, the public space was terminated at this wonderful public park. The park had a very important role and added immense value to the entire community. The "spine" is what the public knows today as South 6th Street, known to engineers as Business Highway 371. If you stand in the park and stare south down this corridor at what remains of the historic downtown, you can visualize how important this street was. The early planners of Brainerd designed this brilliantly to capture as much value out of the corridor and the terminating vista of the park as possible. Throw in the historic water tower that was of a different era but fortuitously placed, and it doesn't take much imagination to see that this area had a strong sense of place and created tremendous vitality for the entire community. Revitalizing Gregory Park is an important step for recapturing the value of this well-placed public space. Rethinking South 6th Street is the next component of the revitalization. Today South 6th is realization of both the engineer's fantasy and nightmare. From a design standpoint, cars rule. The lanes are wide for highway speeds, parking has been completely eliminated, pedestrian life is non-existent and, to top it off, that American "innovation" known as the third lane runs the entire route. It is the engineer's fantasy in that the design is textbook. The engineering nightmare comes with the realization that budgets did not allow for access management through the corridor (eliminating driveways and other accesses). An attempt is made to artificially control the speed through speed limits so all the people turning in and out of the driveways and businesses have some hope during busy times. The corridor looks like this today. South 6th Street in Brainerd, Minnesota, taken incidentally at the height of the evening rush hour, 5:30 PM, on a Tuesday in August. The public realm, being entirely auto-centric, is a harsh place to be if you are not in a car. In fact, if you drive this stretch and see someone well-dressed on the sidewalk, you would be likely to check if they needed a ride. Only those with no other option - the young, the old or the poor - would choose to walk this corridor. The public realm is a harsh place along south 6th Street. Pedestrians, unprotected even by parked cars, must navigate narrow walks just feet from traffic flowing at near highway speeds. Despite this, the remnants of what this place once was still exist. The historic buildings - the ones built before the auto era - perfectly frame the public space. They are close to the street (once a desirable feature but now a disadvantage with the street design as it is) and thus form the correct height to width ratio with their companions on the other side of the road. This design, in a different era, created tremendous value for these properties. Not only did they live on a well-designed parkway that terminated in a beautiful public park, but they were a convenient walk from all of the goings-on in the community. Some nice homes that exist along South 6th Street. Despite the care the owners have taken to maintain these properties, the road design negatively impacts their value. Envision for a second what could be today. 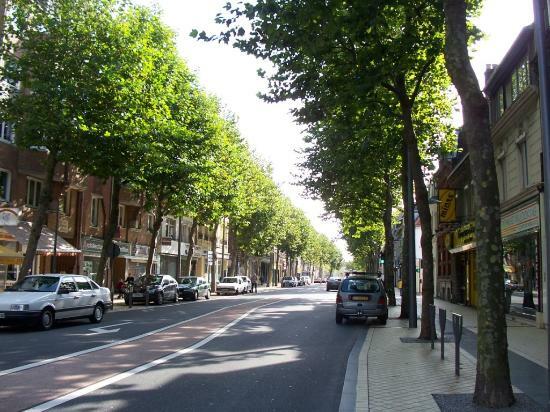 A narrower, more complex street, with two lanes of traffic, well-defined pedestrian spaces protected by a line of parked cars and vegetation. Something like this, terminating in a revitalized city park. A more urban section that most of South 6th today, but the general cross section gives a feel of what is possible. Now, the first thing naysayers will offer is: how do you pay for this? Lest you think my vision is aesthetic-based, paying for this is actually the easiest part. The third lane is possibly the most wasteful design in terms of return on investment that a community could make. The next time this road is reconstructed, if you simply removed the third lane and narrowed the traffic lanes to 11-feet, you would have ample money to either create a center boulevard (beautiful) and/or provide additional enhancements on the road's edge. Despite what the highway engineers may say, it is hard to believe that four lanes are warranted. Switching to two lanes with a well-engineered, green boulevard in the center for turning movements would be a massive enhancement at a fraction of the cost. In addition, this is an investment that will actually create a measurable return, unlike the amorphous return on your ability to arrive at your destination on the other side of town more quickly. Make this street into a complex public realm and watch the properties along it start to appreciate. This is in contrast to the current harsh environment, which depresses property values along the entire corridor. Spend less money, see a return on the investment and all you have to give up is three minutes when driving to the clinic. Sounds like something a Strong Town would do. Check back tomorrow and I am going to show the long-term ramifications of the current style of development that has been induced by the auto-orientation of South 6th Street. (I mentioned that the third lane is an American innovation. I have driven in many parts of Europe - unfortunately not yet in Asia, Africa or South America - and I've never seen or heard a report of this concept put into place anywhere else. If you ponder the reasoning for the third middle lane - to allow traffic to continue to move/flow freely despite the need for turning movements - you should realize that only in America would we spend so much of our resources ensuring the quickest possible auto trip from point to point. Cutting minutes from an auto trip would just simply not justify the tremendous expense anyplace else in the world but here. Also, I talked about the direct impacts in terms of property appreciation that a redesign of this corridor would provide. What is not mentioned is some of the ancillary benefits. Brainerd spends a tremendous amount of money and has locked up some of its most valuable property providing parking. If people were actually enticed to walk along this corridor, not only would it increase the number of people that would be interested in visiting downtown - instead of Baxter, which seems much closer as soon as you are forced into your car by the design - but those people would not be needing one of the priceless parking spaces.